Canelo Alvarez has warned Gennady Golovkin he will show him how a true Mexican fights, as he vows to reign supreme over the middleweight division. Speaking exclusively to BoxNation, who will broadcast the fight live in the UK on BoxNation Box Office for just £16.95, the Mexican superstar said the time for talking is over after weighing-in for his superfight with middleweight kingpin Golovkin. But after both men hit the scales bang on the 160-pound mark Canelo told BoxNation that he is raring to go and will capture the Kazakh knockout king’s WBC, WBA, IBF and IBO world titles. “I’m ready to go! The talking has been done, we have weighed-in and now it is about getting in the ring and fighting. 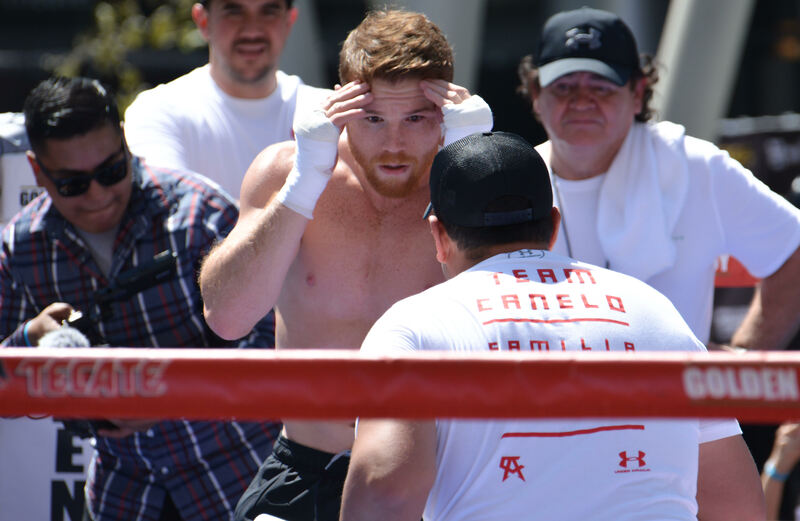 I’m ready to show how a true Mexican fights,” said Canelo. “I am going to give the fans a special fight – a real fight. I am ready for him and whatever he comes with. If he wants to stand toe-to-toe I will not back down. However he wants to fight I am ready. “This is the fight boxing wanted and now it is here. I am ready to reign at the top of the middleweight division for a long time,” Canelo told BoxNation. 35-year-old Golovkin goes into the ring as the naturally bigger man but Canelo has shown his world-class ability by already claiming the accolade of being a two-weight world champion. To claims that Canelo is going knock him out, ‘Triple G’ was quick to fire back and said he still has a long time left in the sport. “Let’s see on Saturday if he is going to knock me out. I’ve been a champion a long time,” said Golovkin. “In boxing every day is difficult and dangerous. Right now I feel great. Everything’s good. My family and my team support me. I feel very comfortable. I want to box for five years more – maybe until 40,” he said. Taking place during the Mexican Independence Day holiday this weekend, fans have been streaming into Las Vegas from all corners for a fight that Golovkin has promised will produce fireworks when it gets underway at the sold-out T-Mobile Arena. “This is our Mexican Independence Day holiday weekend gift to boxing and to boxing fans. The fans have been asking for this fight for years. We are going to give a great battle,” Golovkin said. “I am very excited to be finally fighting in Las Vegas, but I am more excited that it is against Canelo. The energy will be off the charts. “Let me repeat – this is a fight boxing can be proud of,” said Golovkin.